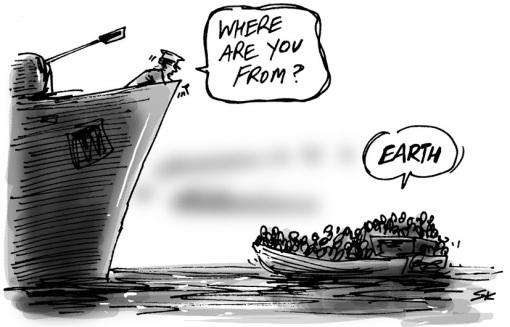 Tagged asylum seekers, cartoon, cartoonists, refugees, where are you from? The cartoon first appeared in Australian Options magazine – discussions for social justice and political change – which is celebrating its 20th year of publication! I have drawn cartoons for every issue. That’s great sim. an opportunity to express further your ideas. Nobody refers to us as (collectively) as humans or earthlings. Or planet lovers!! ha we’ve got so far to go it’s painful! I like it. Well done. Now back to work. It makes some time since I saw for the first time this cartoon, and it´s one of the best cartoons I’ve ever seen about this theme, for sure. Congrats, Simon! Thank you Telmo! I do cartoons for a political magazine Australian Options and I get to read all the articles first – getting informed by writers that understand what’s going on far better than me. We cartoonists do feed of other peoples’ good work! And we cartoonists do try and simplify and clarify complex issues into a drawing that works (fingers crossed) within a reader’s head in just a few seconds.With this asylum seekers cartoon I was lucky that the perfect (and correct) punchline popped into my head and all I could say was ‘of course!’. You would know the feeling, after maybe hours wrestling with complicated ideas, your brain does surprise you, coming up with the right image or caption that makes a cartoon work.